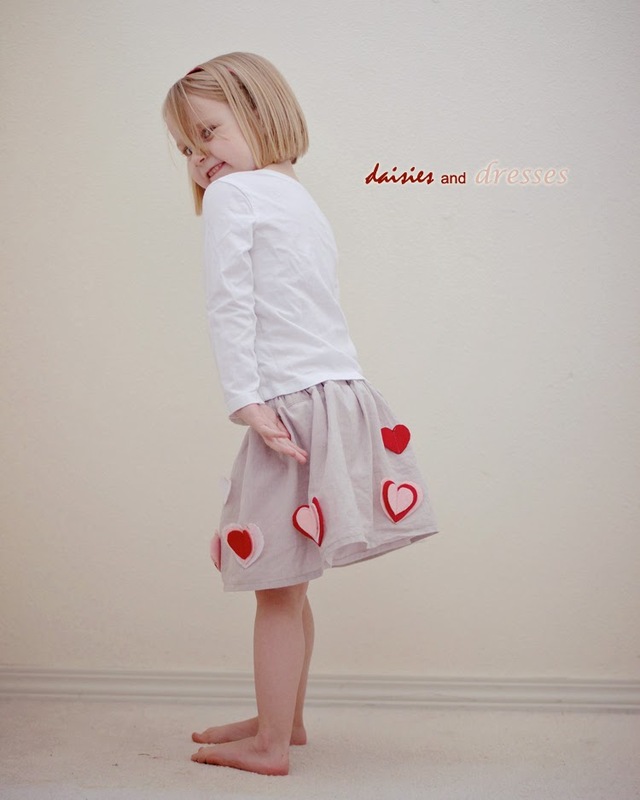 Do you need a quick themed skirt for a holiday or event? 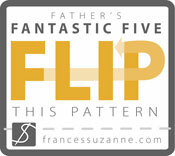 I have a very simple tutorial for you today. 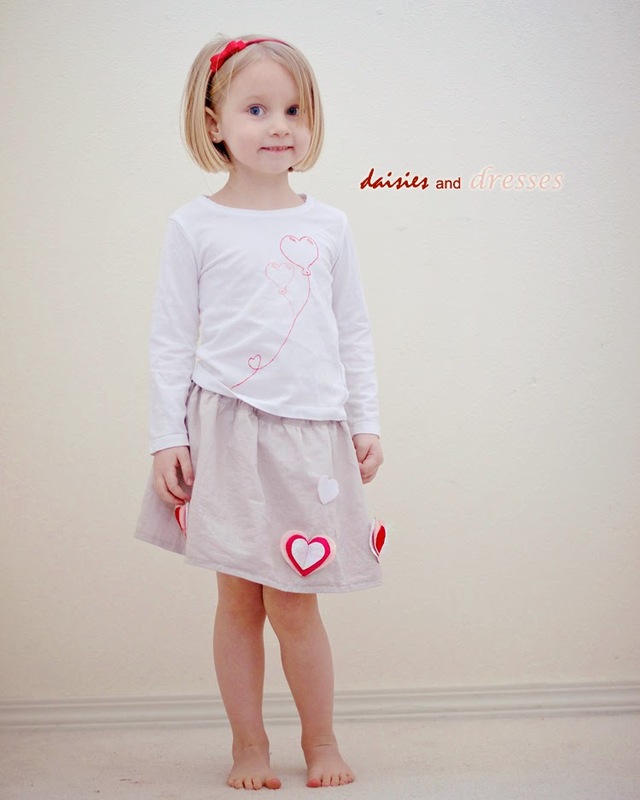 You can add this to any any existing skirt or whip up a simple elastic waist skirt. I won’t do a tutorial for making the skirt itself since there are a lot of great ones out there (like this one), but I will show you how to add these cute felt heart embellishments but you use any shapes you'd like. Shamrocks for St. Patrick's Day. Bunnies or easter eggs for Easter. Maybe balloons for a birthday. Have fun with it. 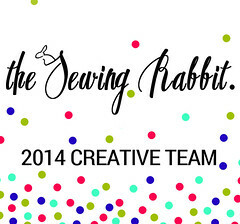 If this looks familiar, it's because it was originally written for Sewing Rabbit but I'm bringing it home today. Several colors of felt. I used red, dark pink, bright pink and white. 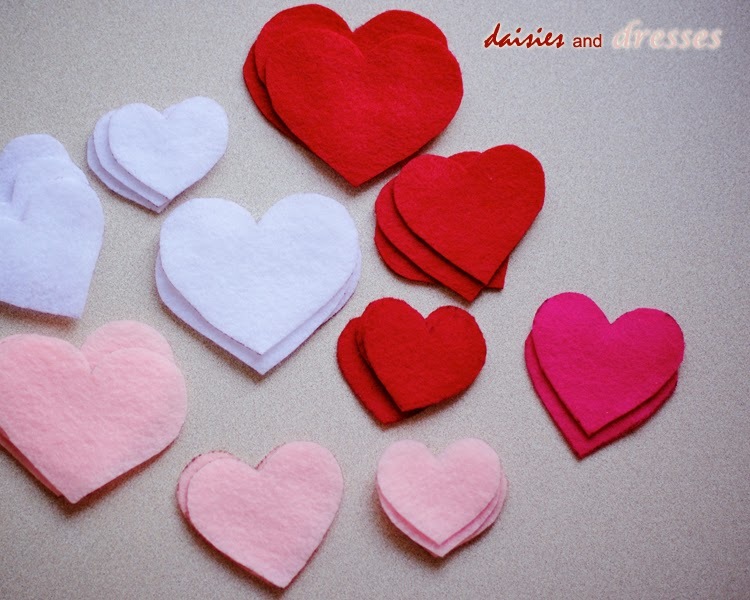 You could hand sew these as well, but a sewing machine makes it go much faster. 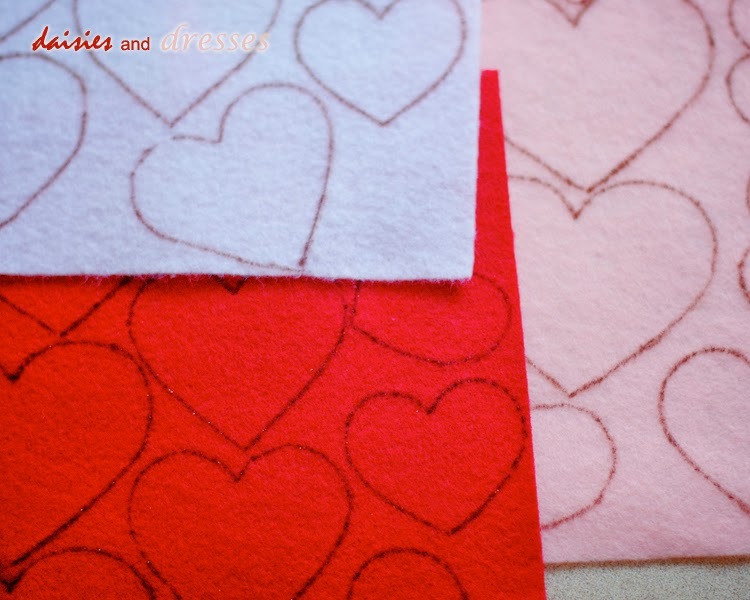 Start off by drawing some heart templates on paper in three different sizes. Stack them up until you like their sizes relative to each other. It sounds complicated but just play it by ear and have fun with it. These are what mine looked like when I was happy with them. Next, trace them out on your sheets of felt. I traced 3 of each size in each color just to make sure I’d have plenty. There is no set amount that you’ll want. 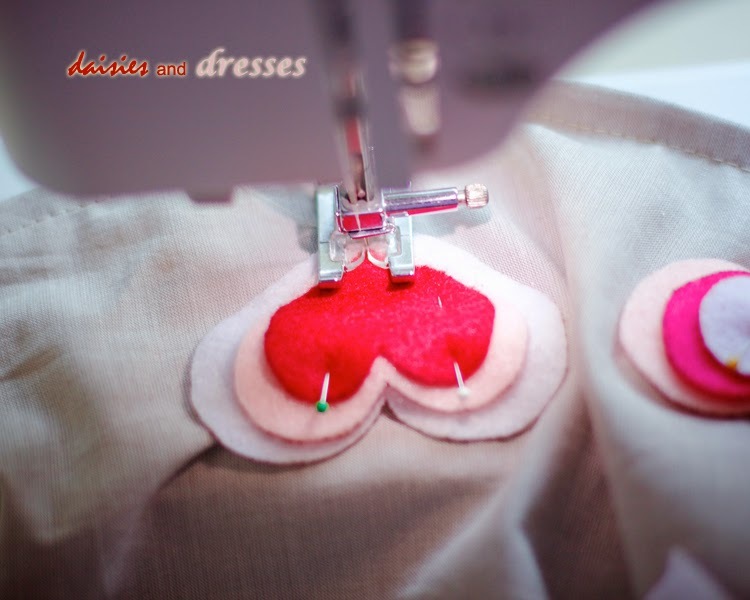 It depends on the size of your hearts, the size of your skirt and how many hearts you want on your skirt when you’re done. Felt is cheap, cut as many as you want. 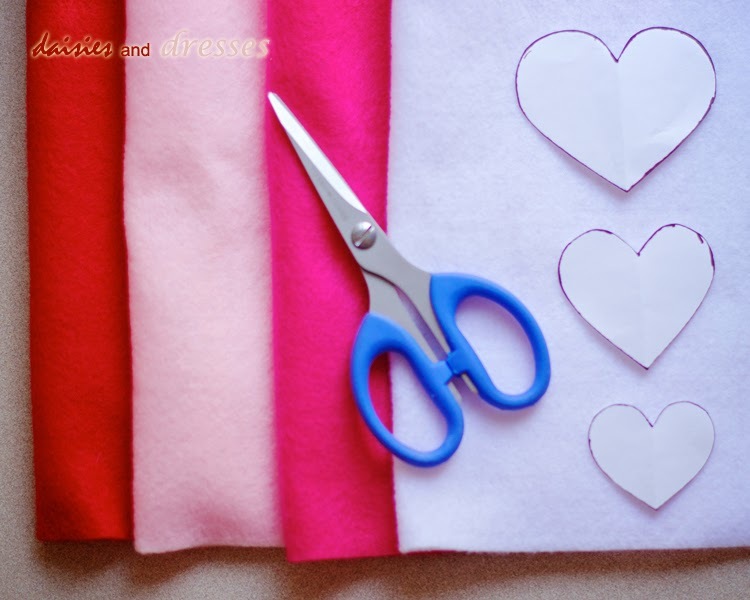 If you have too many at the end, you can use them as embellishments on something else later. My daughter made some cards for her brothers out of some of our leftovers. I used a dark sharpie to trace these so that they’d show up for the photos, but I’d suggest using a color that closely matches your felt. That way, it won’t show up on your final project. You don’t finish the edges and some of my hearts look a little too “homemade” for my taste with their dark sharpie edges, if you know what I mean. After you cut out all of our hearts comes the fun part. Stack them all up and make them pretty! Play with your color combinations until you think they look good and have the variety you’re going for. My daughter had SO MUCH fun helping me do this part. 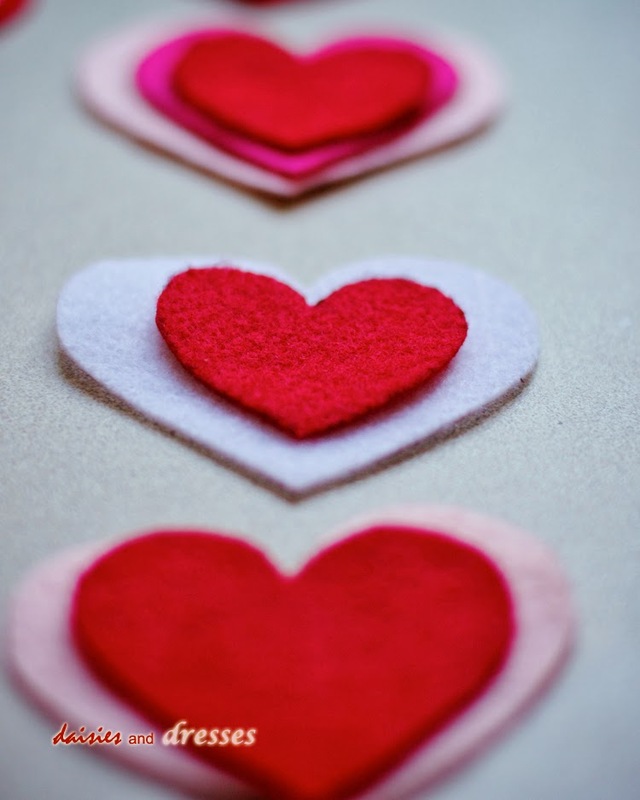 She painstakingly arranged and rearranged these hearts until they were just right. Look at all of those pretty stacks! Pin them onto your skirt in whatever configuration pleases you. I liked mine a bit asymmetrical and clustered them toward the left of the seams. 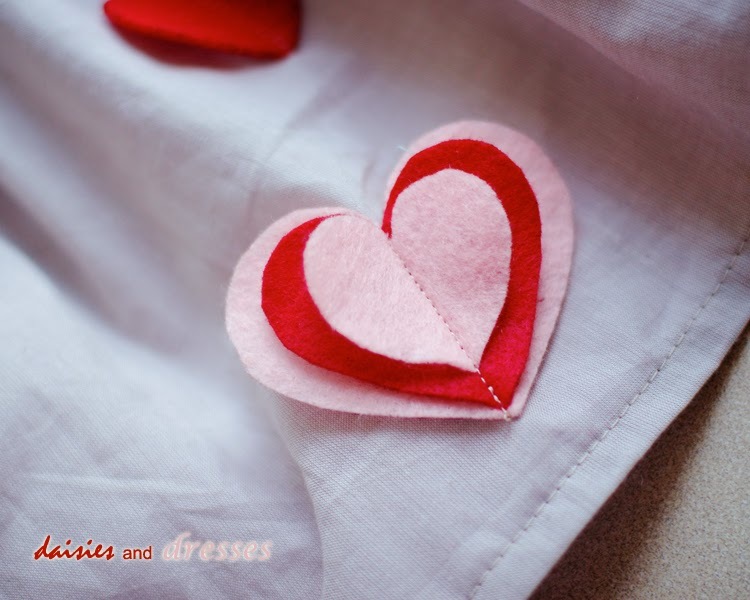 When pinning, keep the center of the heart clear because that is where you’ll sew them down. I found that two pins was plenty to keep them in place. Now, start sewing. 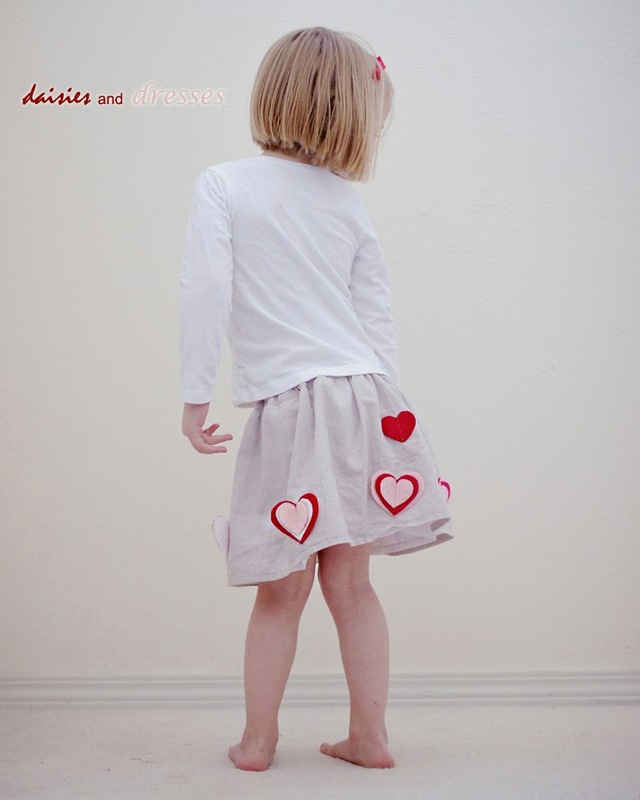 I had a two layer skirt, so I sewed these starting at the tip, but you’ll get a better point if you start at the top of your heart and sew toward the tip. Because of the construction of my skirt, though, this was a whole lot easier for me. Don’t forget to anchor your stitches with a backstitch at the top and bottom. 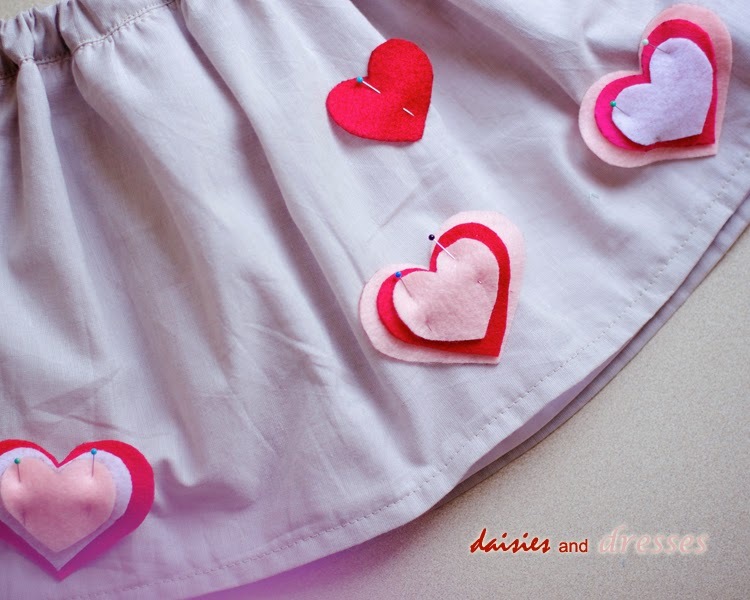 Go around your whole skirt and sew them all on. 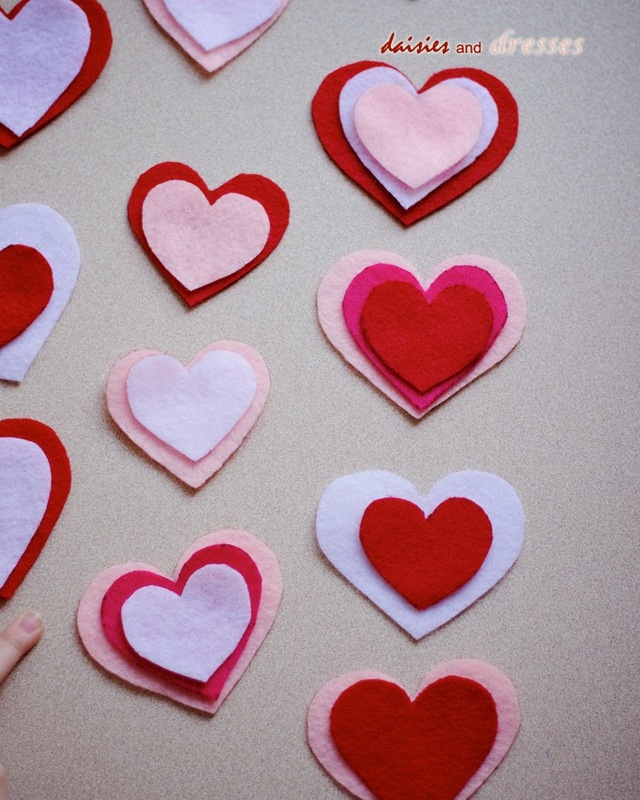 The last step is to fold all of your hearts along the seam to make them stand out a bit, but you can keep them flat if you’d like. It’s up to you.